We’ve all been there. It’s 12:30AM and we are about to go to bed when the next episode of The Walking Dead or Orange is the New Black comes on. Just one more hour, you tell yourself. What’s one more hour? I’ll just take my laptop to bed and “rest” there while I watch it. What’s so bad about that? More than you think. That overexposure to blue light at night not only cuts into your sleep time, but it’s having more serious effects on your body than you know. An astounding 95 percent of people surveyed say that they regularly use laptops, computers, tablets, play video games or use their cell phone right up until bedtime, and often take their cell phone or other electronic item to bed with them. 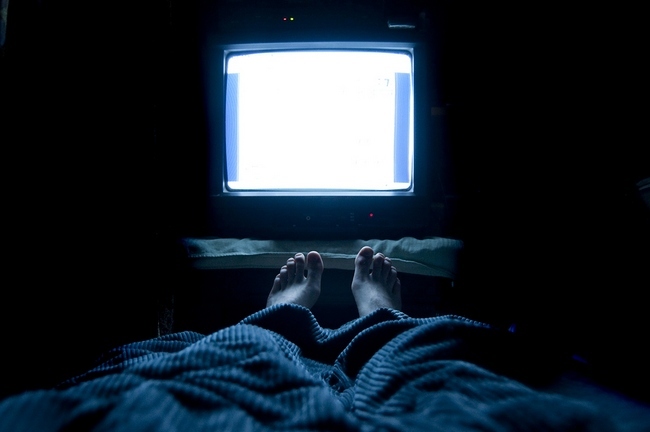 If you haven’t heard, the blue light that television screens, laptops, tablets, and cell phones emit should be discouraged as this type of light stops your body from making a hormone that tells your brain it’s time to sleep. That hormone is called melatonin. Your sleep can be seriously delayed because of the excitement and involvement with computers, phones, and television shows. Not only this, but a recent study by the National Sleep Foundation showed that ten percent of people said that they were often woken up by a text message or call on their cell phone, more than once a week. A full 67 percent of baby boomers stated that they watched TV right up to the time they went to bed and six out of 10 people use their laptop just before sleeping. And Americans wonder why they can’t get a good nights sleep? Not convinced? Let’s take a look at some research and check out the top 7 reasons why you seriously need to quit the late night blue screen habit. Some of these might be enough to shock you into changing your habits. Although there isn’t conclusive research, there is evidence that late night light exposure can affect the risk of developing certain cancers, such as breast cancer. It’s thought that this might be connected to the effect this light has on the production of melatonin, which might act as a cancer suppressor. This was reported by LiveScience. Find out 3 reasons to avoid melatonin. The journal Nature published a study in 2012 that suggests that being exposed to light over a long period of time caused subjects to display depression like behaviors, as well as vastly increased levels of the stress hormone called cortisol. Now this study was done with animals but one study researcher, who is a biology professor at John Hopkins, explained that mice and humans are very, very similar, which is why mice are often used in research studies. Mice also have cells in their eyes that are activated by light, the ways humans are. Also, this study made references to previous studies which were done on humans, and these studies showed that light actually can impact the human brain. When you fall asleep in front of your phone, tablet, laptop, or television, it means you are falling asleep with the lights on. A small study done in 2013 showed that sleeping with light means more shallow sleep, and less of the deep, restful sleep your body really needs. Those who go to bed late, say after 11:30pm, have been linked to having lower grade point averages as well as being susceptible to emotional problems, compared to those who go to bed earlier. This is according to a study published in the Journal of Adolescent Health in 2013. Want more proof? Another study done in 2007 and presented at the Associated Professional Sleep Societies, showed that those who stay up late on school nights, even if they try to make up for it by sleeping late on weekends, do much worse in their academic life. TIME magazine also reported on a study done in 2012 that showed that teens have many more academic problems when they spend less time sleeping than they should. The journal Fertility and Sterility published a study that demonstrated that light at night time can impair a woman’s fertility, due to its effect on the production of melatonin. Melatonin is a hormone which is vital for the protection of a woman’s eggs from the damage of oxidative stress. Night owls, those who tend to go to sleep after midnight and wake up in the mid to late morning, not only sleep less than what would be considered “normal” ( generally those who fall asleep before midnight and get up around 8am) but they also tend to eat more calories at dinnertime than normal sleepers. Night owls were, overall, found to have higher body mass indexes. Among their habits, eating after 8pm was the strongest predictor of having a higher BMI. What does all this mean? Well, not just what you eat, but when you eat, appears to affect your body’s ability to lose weight. Your sleep habits definitely have a major influence on when you eat, as well as how much you eat. Another study reported by the Washington Post, which was done in 2005, showed that those who sleep less than 7 hours a night were much more likely to be obese. This data was based from a study done with more than 10,000 people between the ages of 32 and 49. If you like going to bed late but still have to get up early to get to school or to work, then chances are you are not getting all the Z’s your body needs. Of course, none of this is a problem if you believe that a good nights sleep really doesn’t matter and you chose to ignore the studies in this article. However, for those of you who know and understand just how important your 8 hours of Z are, then take some good advice and turn off those screens about 30 minutes before bedtime for a restful night of sweet dreams.